Mt Hood Things to Do! Mt Rainier Things to Do! TOP 20+ THINGS TO DO IN WINTER NEAR PACKWOOD BESIDES SKIING! To access snow play spots out of Packwood here are a few roads that go up into the mountains and snow line. Packwood is only at the 1000’ level so the snow has to be low in order to reach snow in a reasonable amount of time on some of these road. Some are plowed, some not. You should carry chains and exercise caution and always have an emergency kit in the car with you at all times. Contact the Gifford Pinchot National Forest to check the accessibility of these areas as there can be fallen trees from previous storms. The Randle Forest Service Office number is 360-497-1103. Highway 12 East towards White Pass – this is the most popular spot to go to. At the ski lodge to the right is the perfect place the sled with the kids. When you get cold head into the lodge for some hot chocolates and one of their famous brownies! Snow play can also be found across the street from the lodge behind the condos surrounding Leech Lake. The perfect place for cross country skiing, snow shoeing, winter hiking and some secret stash sledding areas! Snyder Rd to Packwood Lake – this road is not gated and it is not plowed as well. Drive to the snowline and find a place to pull off and play in the snow. No winter park pass is required. If you can make it to the parking area it is well worth the hike in part or all to Packwood Lake. There are 2 trails. The trail head from the parking area that is in trees most of the time OR walk back down the road to the gate and the ATV trail. Hike in a mile or so for some of the most spectacular views of Mt Rainier and the Packwood valley below. This is a great spot to cross country ski or snowshoe. Johnson Creek Rd 21 is west of Packwood of 12 – this road is not plowed as well yet it is traveled because there is a snow park up a ways where people park and snow mobile on groomed trails. Cispus Rd 23 – Go west to Randle, in Randle go left onto 131 then go right onto 23. This road is plowed for some miles and it follows the Cispus River…gorgeous! It leads up into the Gifford Pinchot National Forest towards Mt Adams. Once in the snow there are many spots to pull over and play, sled or snow shoe. WHITE PASS SPORTS HUT is so cute and they rent skis, snowboards and snow shoes. Snowshoes are only $15 a day. They also know a lot about the area and what to do and where to go! Have a campfire at the cabin and cook s’mores and hot dogs. Sit in the hot tub and soak it all in and relax! Visit the Packwood Library and check out some books or videos. At Blanton’s Supermarket checkout a DVDs from their rental room with all the top movies you will ever need! Winter Fishing – fishing is always open in the Cowlitz. Go down Skate Creek rd and before the bridge walk down to the left to access the river. The upper Cowlitz is stocked with Salmon all year long. Visit Mt Goat Coffee and Bakery in downtown Packwood. They roast their own beans and make fresh homemade muffins and cookies daily! Play Bingo at the Packwood Community Center every Friday, doors open at 6PM. Winter hours start the Saturday following Labor Day and are Saturdays from Noon to 4 PM. If you are in the area and cannot make it on the days that we are open, please call the following phone numbers to arrange for a special tour. Dave or Martha 360-494-4031; Don 360-494-5343; or Janice 360-494-4007. Visit the Blue Spruce for some great food and kids are welcome. Many draft beers on tap. Every Tuesday night is ALL YOU CAN EAT TACOS for just $2.50. DeGoede Bulb Farm – Travel west on 12 to Mossyrock. This is a cute little town off highway 12. Past the light is DeGoede Bulb Farm. This is a beautiful place to visit not just to buy plants and things but they also have a show garden you can walk through! 13 In Morton, our favorite stop is Spiffys. They have the largest and best soft serve ice cream ever. The outside food window is open all year. Travel west on Highway 12 and go right into Morton and then take your next right. Spiffys is down on the right. Good burgers and fries too! 14 We really love Cruisers Pizza in Packwood. Although spendy but there is really no crust like it anywhere. They have been in Packwood for years and their recipe and goodness has not changed! Cliffdroppers Burgers are probably the best in Packwood. This family run restaurant has stood the test of time. They handcraft their burgers, the fries are generous too. The milk shakes are not to be missed as well! Mount Rainier National Park – is open at the Nisqually entrance for winter recreation and hiking. Make it a day! From Packwood in winter go west on 12, go right at Morton (don’t forget Spiffys ice cream and the Mexican restaurant in Morton has good food and Margaritas as well) on highway 7 go to Elbe. In Elbe go right onto 706 and head straight to the Nisqually entrance to Mt Rainier National Park. The Longmire Visitor Center and restaurant is open in winter and if you like brave the trip to Paradise (weather permitting) and sled, snowshoe and hike in the snow (traction tires and/or cahins are at times required). Historic Mineral Lake Lodge – This 3-story log lodge has been placed on the National Registry of Historic Places. It was built in 1906 to resemble the rugged elegance of a German wilderness hunting lodge. This is on the way from Morton to Elbe. Morton’s Roxy Playhouse – The newly renovated, 1930’s Roxy Playhouse offers onstage action, romance, and laughter captivating audiences through song, dance and dialogue. Morton Depot – Built in 1910, the two story frame building is one of the last of this type of Milwaukee stations in existence today! Northwest Trek Wildlife Park – Northwest Trek is a 715-acre wildlife park featuring a 435-acre free-roaming area tram tour. Pacific Northwest native species are exhibited in natural habitats. The Little White Church in Elbe – This beautiful 18 x 24 foot National Historical Monument still bears the original inscription placed there in 1906 “Ev. Luth. KIRCHE” (Evangelische Lutherische Kirche) a reminder of the people’s origin. Pioneer Farm Museum & Ohop Indian Village – Journey back to the 1880’s with your tour guides to experience homesteading in Washington. Journey back to a time before the first contact with Europeans to experience the seasonal Ohop Indian Village. We hope that you stay in a Great NW Cabin this winter (or Summer). See all our cabins here at Great NW Cabins or call us anyday from 9-9 PST for information and reservations. Lake Heaven off Highway 12 for Kayakers, Swimmers and Picnickers! 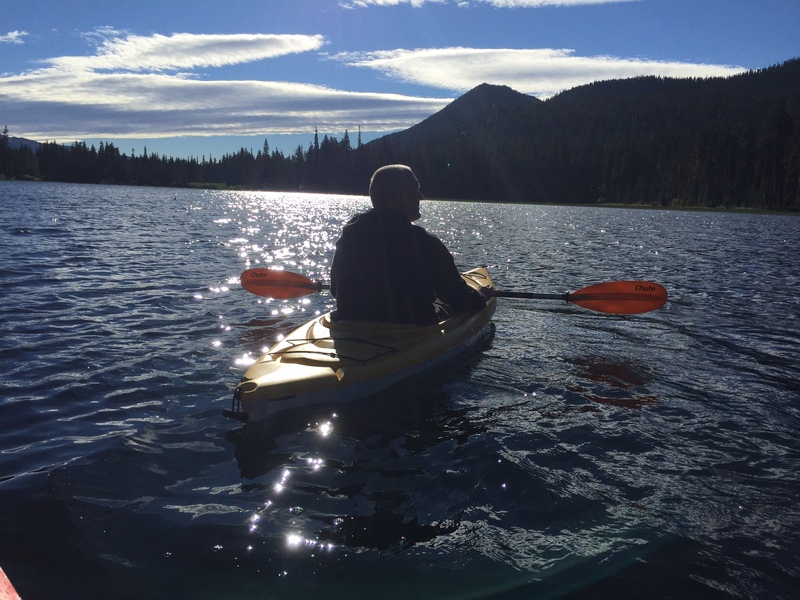 When staying in Packwood you are so close to so many small and large mountain lakes. West of Packwood are what I call the large lakes, Riffe, Mossyrock and Mayfield. These lakes support large boats and jet skis. Mayfield Lake is the most popular with a great marina, beach and picnic area. 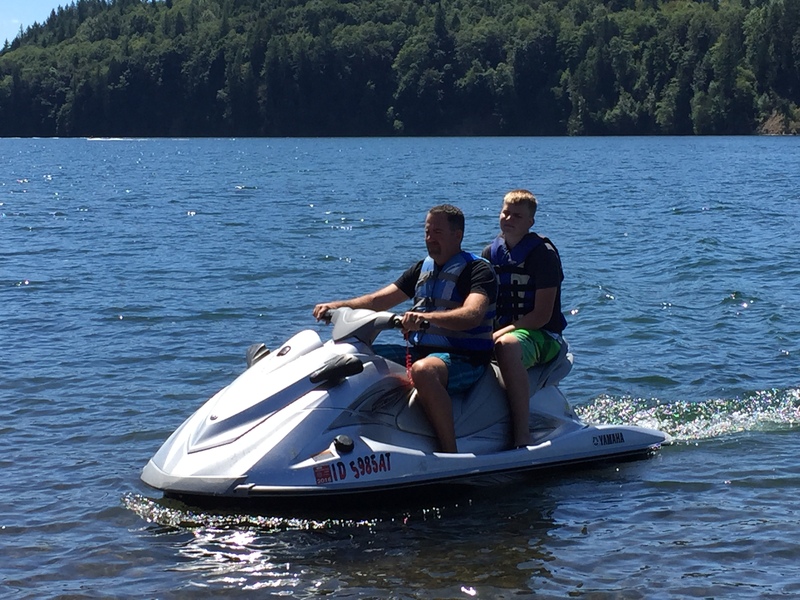 You can rent a boat, jet ski or wave runner for a great rate. We rent a wave runner. Our kids will always say it was the best vacation they’ve ever had. We usually make it a whole day. The lake is 40 miles west of Packwood on highway 12. We set up at the Mayfield Lake Park under the trees (get there early in summer). They do have charcoal grills and picnic tables so BBQing hamburgs and hot dogs with macaroni salad and chips is a must. After setting up, my friend and I unload the kayaks and head to the marina to pick up the wave runner. On a sunny day there is no better rush than gliding across this pristine lake at 60MPH or pulling the kids on the tube (came with the waverunner) and hearing them laugh and watching them fall off into the cool water. For a few hundred dollars you get a whole afternoon of family fun. We usually pack up as the sun is setting and head back east to Packwood. We can’t pass Morton without stopping at Spiffys and getting a huge soft serve ice cream (go left off highway 12 into Morton and take your first right and Spiffys outside food window is on the right). Both Mossyrock and Riffe lakes are just as beautiful and pristine and there are so many spots to picnic, swim, kayak or fish. East of Packwood are what I call the “small lakes”. We love getting up early in the morning and head to town first to get a freshly roasted coffee and muffin. 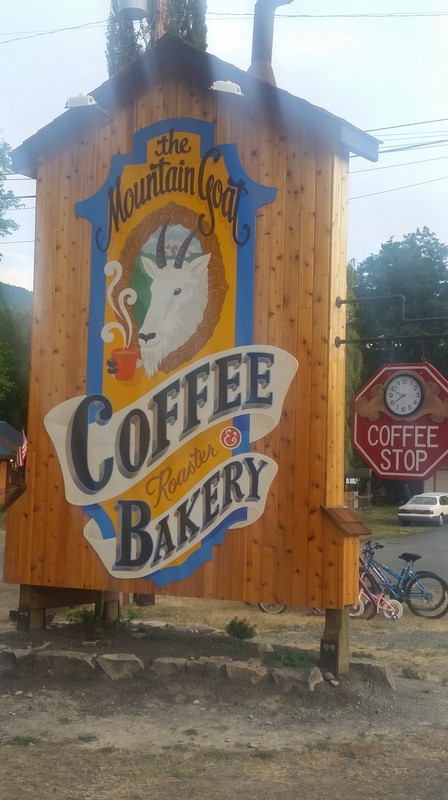 The Mt Goat Coffee shop is in the center of Packwood and in the morning IS the center of Packwood. They have some of the best coffee anywhere! Grab a mocha and take a pound with you. It’s fresh, smooth and the staff is friendly and helpful. Head east up highway 12 towards White Pass Ski Area. The first small lake is Leech Lake direct across the highway from the ski area behind the condos. This is the lake that you cross country ski around in the winter with groomed trails. In summer you can hike, camp, swim and picnic. But we have come to kayak. 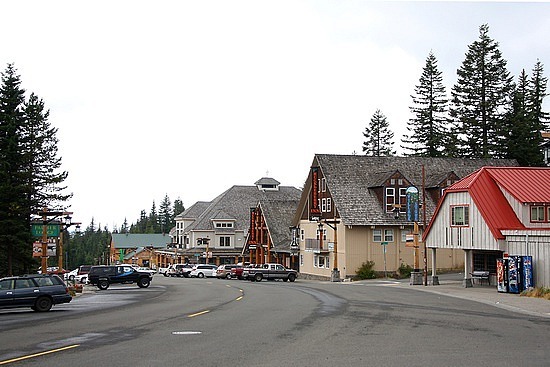 Access to the east end is located right after the White Pass store on the left. All these areas are fee areas so bring $5 with you to fill out the envelope and place it in your car. The put in is a short way in to the left. This small lake is a gem for sure. The surrounding peaks are spectacular but the best view is of the ski area itself. You feel like you are in a commercial for Sun Valley with the ski lifts and trails looming over the lake. As the sun comes up the water is glistening like silver, the fish are jumping and the geese are squacking. All of these lakes are so clear and clean you can see the bottoms with fish and grasses. There is nothing like being out in the middle with the sun in your face. The peace is complete stress detox. Spend an hour or take the family to any of these lakes for a day of fun and food! The second small lake is a short drive down highway 12 east. To the left is Dog Lake. There is a put in and parking on the west end at the campsite. This lake has a dramatic rock covered mountain at one end. You can see this shale covered hill from the ski trails in the winter. At one end is a literal bird sanctuary. We observed an eagle in her nest at the top of a dead tree. She was protecting her young and watching over the lake as if this was her military outpost. We wanted her to swoop down and fly but she never moved from the edge of that nest that morning. Again this is another great spot to spend the day with the family or a few hours in the morning before returning to the cabin for a big brunch. The third lake is Clear Lake. Head east again on highway 12 towards Yakima and about 10 more miles from Dog Lake you will see the turn off to the right. How is it that you come to a place to vacation for years and never explore these areas? Someone told me about Clear Lake years ago but this was my first time to experience it. WOW what a jewel. This lake is on the east side of the Cascades so if it’s cloudy in Packwood you can bet it’s clear and sunny at Clear Lake. Only a few miles in this mountainous area reveals the blue water to the left. It is the largest of the 3 small lakes. The day area is located to the left as well. There is a covered picnic area with charcoal grills, bathrooms and docks to fish off of. There is a large shallow sandy area where you can walk across the lake. Clear Lake is surrounded by mountain peaks with a real cool island in the middle. Kayak out to the island and take a nap on the soft grasses and enjoy the views. They do allow small motor boats on the lake but because it’s off the beaten path location it’s never really crowded. It is a hidden gem and one of the best small lakes to spend the day with the family. The fourth lake…oh bonus, there is a fourth? Yes there is! But it’s not small by any means, it’s Rim Rock Lake. This is just a few miles east of Clear Lake on highway 12. This large lake has campgrounds along it’s shore with put ins for ski and fishing boats. At the far end is the dam and the start of the Tieton River. In September they let out the water so that rafters can hit the white water. So come back for a September weekend to remember. Stay Friday night at the cabin, head up to raft Saturday, return to the cabin for a great meal and campfire and head back home Sunday morning. 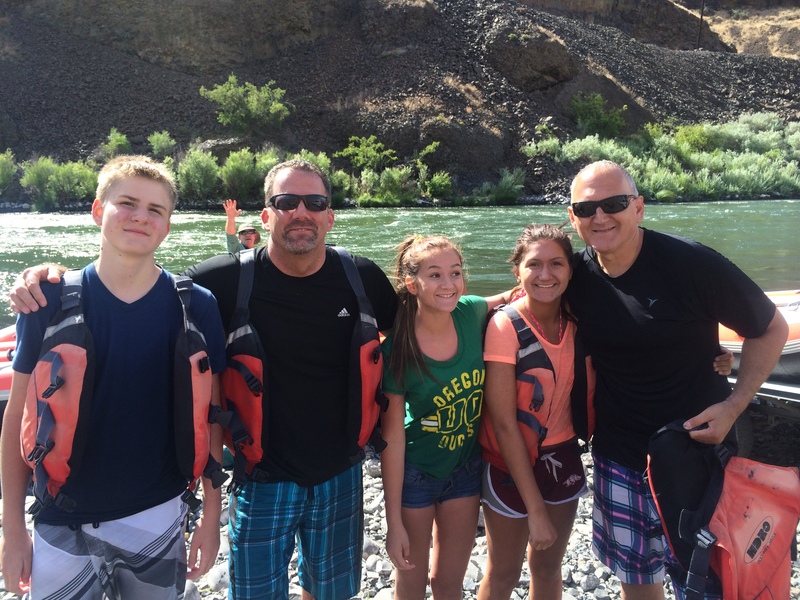 See our blog article about rafting the Tieton. We hope you enjoyed this article. To book one of our Packwood Cabins for a lakes getaway go here at www.greatnorthwestcabins.com or call us anyday from 9-9 PST at 503-492-8783 for information and reservations! Categories Mt Rainier Things to Do! Raft the Deschutes When Staying in our Mt Hood Cabin! 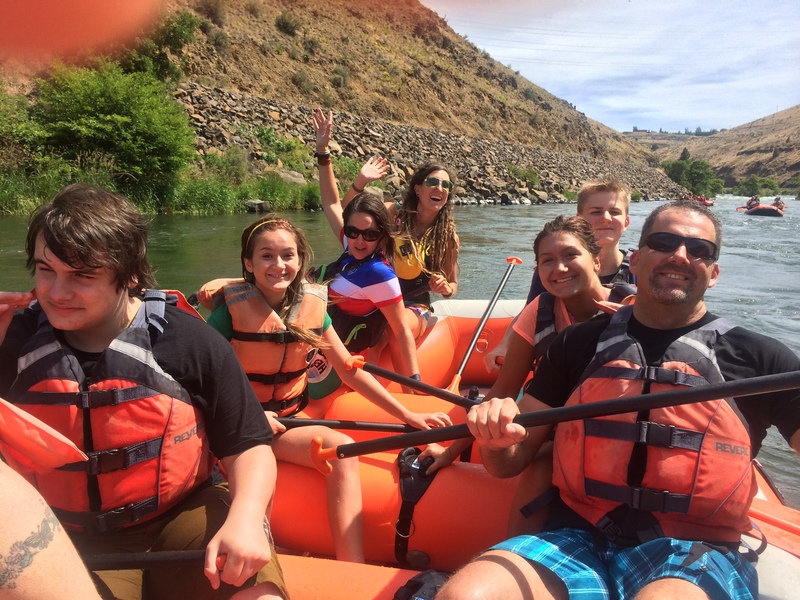 300 days of sunshine a year is the recipe for a great rafting experience on the Deschutes! If you are staying at our Mt Hood Cabin in the summer there is one thing that you do not want to miss…Rafting the Deschutes! Less than an hour away is the Oregon capital of river rafting, Maupin. Maupin is a cute small high desert town east of Mt Hood. There are over eight different rafting companies that will take you on a half day or more river rafting extravaganza. Like all residents of a state that live close to tourist activities, I was guilty of not taking advantage of this opportunity. I have lived here for over a decade and heard about Maupin and the river but never ventured over the mountain to this part of the state. After I see a Groupon coupon for rafting I was determined to do it. I’m not getting any younger and the bucket list needs to be worked on. So I bought some vouchers, convinced some friends to do the same and we were off for the weekend, staying at our Mt Hood Cabin. That Saturday we left the cabin at about 11:45AM for a 12:30PM check-in. We were scheduled to hit the white water at 1PM. Our Groupon was for a company called High Desert River Outfitters. They ran a special for 50% off. So for $30 a piece we had ourselves 3 hours of fun…the best $30 I’ve ever spent. Just traveling over Mt Hood is a treat. The peaks, glaciers and trees are always refreshing to look at. As you are headed east on highway 26 head towards central Oregon. and watch for the signs that say Maupin on Route 216. This road gives you the complete Oregon landscape from fir trees, then ponderosa pines, to the hay fields and ranches of the high desert. Don’t worry about weather. Maupin has 300 days of sunshine a year so if it’s cloudy on the west side come on over to the east side for some sun and warmth. You eventually hit highway 197, go right to Maupin. We arrived, parked and checked in. After filling out the proper paperwork we had a tailgate picnic and loaded up on some much needed calories as we knew it would be 3 hours before we ate again. We used the dressing rooms provided and changed into our bathing suits, sandals, sun tan lotion (a must) and were fitted for our life vests. We then loaded the shuttle bus with the crew and we were off to the river. The trip lasted about 2.5 hours on the water with one stop to swim the rapids, which I highly recommend (I did it twice…why not). The rapids ranged from a Class II to V, mostly III’s. At the entrance of each rapid we were briefed, no one fell out, teamwork a must. I saw young kids and grandma’s in rafts, everyone enjoying the day and the water. After a great trip we loading the rafts and the bus and headed back to base camp while listening to the jokes and stories of the guides. The whole trip made you feel like family, wanting to come back again. As we reached Maupin the guides gave us some recommendations for dinner. We ended up hitting Oasis Café. This historic (hole in the wall) café…yup…you guessed it, great food. We had the recommended burgers, beer battered fries and peanut butter shakes. If you tell the waitress the name of your HDRO guide they get a free shake the next time they come in. After dinner we crossed back over the Deschutes bridge on highway 197 and wouldn’t you know it, our guides walking on the bridge headed to their hangout place for that free shake…and a few beers I presume! Here is a list of all the rafting companies in Maupin. Happy vacationing in our pristine state! While here make sure you stay at our Mt Hood Cabin. This 3 bedroom, 2 bath home has it all from hot tub, firepit, bbq, ac, full kitchen, wifi, flatscreen TV, cable, DVD and pillowtop mattresses with quality sheets and linens. 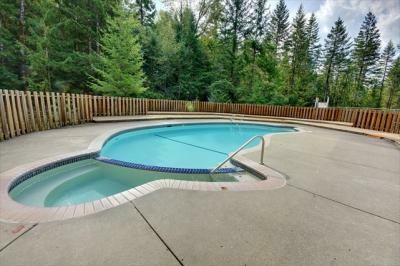 Not to mention our summer heated outdoor pool, tennis court and Sandy River hiking trails exclusive to our cabin community. 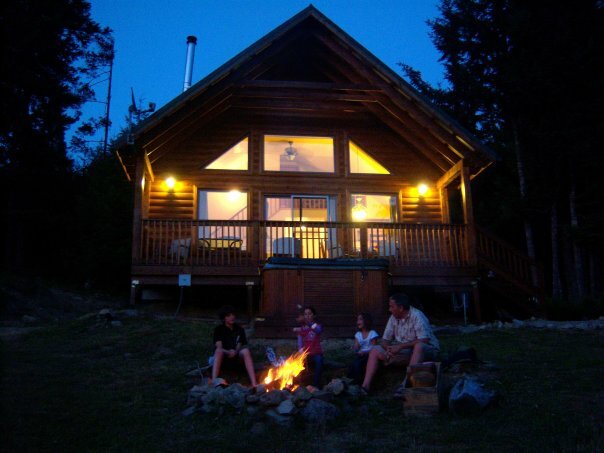 See the Mt Hood Cabin website here at www.greatnorthwestcabins.com or call us at 503-492-8783 any day from 9-9 PST for information and reservations. We will be glad to answer your questions. That’s me, Bob to the right, my 2 daughters to the left and friend Don and his son Ethan…good times had by all! Categories Mt Hood Things to Do! 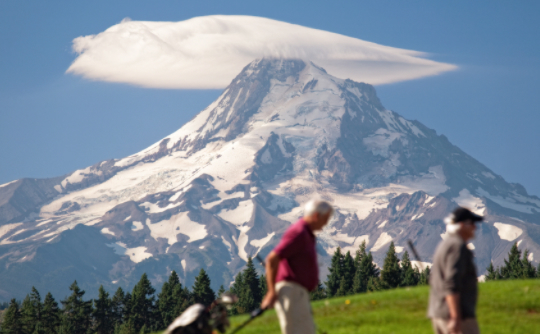 The Top 10 Things to Do in Summer at the Mt Hood Cabin! When I go away on vacation I struggle to decide what to do in an area when there are so many choices. Here are 10 things to do when staying at our beautiful Mt Hood Cabin in the summer, all within miles of this paradise! 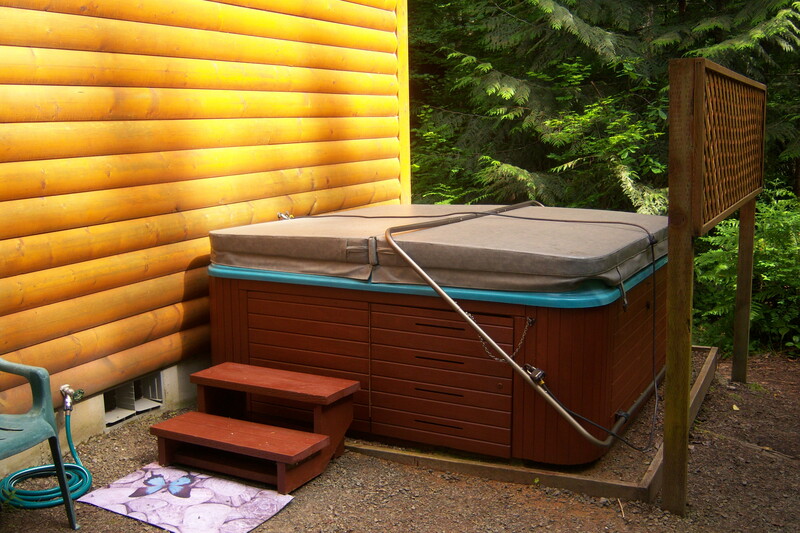 Firepit, hot tub, bbq and patio furniture ready to use at our Mt Hood Cabin! Why go anywhere right away? When you rent a place you need to enjoy it first before jumping up and heading out. When we go to the cabin we love to sleep in and get up at about 10AM. The sun shines in the great room windows and that is a great sign that it’s time to eat breakfast on the deck. Gather the breakfast cereal, coffee and sweet rolls and enjoy the trees, birds and forest smell as the sun shines down and warms your morning! After breakfast we hit the hot tub for more relaxing. “Why go anywhere right away when we have rented a beautiful vacation home in the middle of forest heaven?”. Within minutes from the cabin, walk here! Our cabin is in a village of other fine vacation homes and cabins called Zig Zag Village. Go out the door and take a right and the trail starts right at the end of the road. This trail meanders through the woods, over the creek and within a few minutes the trail is following the mighty Sandy River. 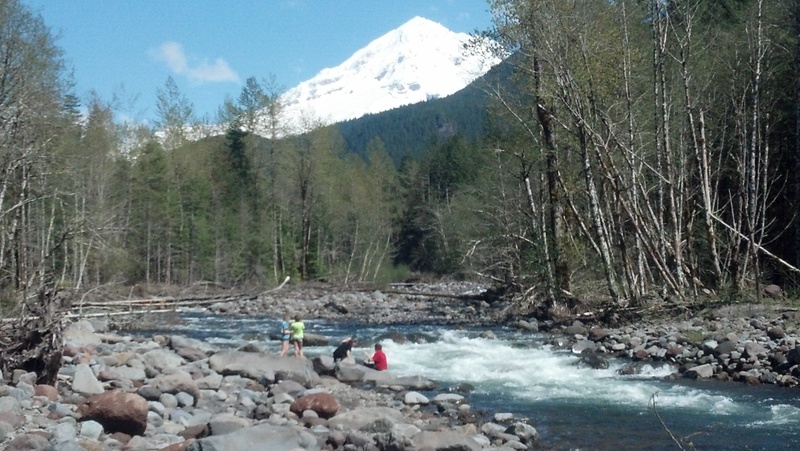 There are so many spots to go down to the river, picnic, play and enjoy the views of Mt Hood. You can take this trail up into the National Forest and to the trail head to Ramona Falls (Apx 6 miles total, 12 mi roundtrip). You can also go out the door of the cabin and go left. Follow the road and before it goes left go right and follow it down to the pool and tennis court. Beyond the tennis court are more trails that lead to the Sandy River and beyond. We love taking morning or after dinner walks with our dog. This is one of the reasons why we fell in love with this village and bought this lot to build this cabin. The pool is heated and ready for a refreshing swim! Go out the door of the cabin and go left. Go to the end of the road and before it turns left go right. Follow this road down to the pool and tennis area. It takes less than a few minutes to walk there and is real safe for the whole family. The pool and tennis court sit in the middle of the forest. Bring your towels, chairs and pool floats. There are showers and bathrooms. We love to sunbath and enjoy the trees blowing in the wind. The setting is wonderful and the pool heated and clean. Our tennis court is very nicely maintained so bring the rackets with you. Our village is small so many times the tennis court is available for you to just walk in and play. Our village is located off of Lolo Pass Rd. You can ride your bike on our hiking trails or head up Lolo Pass Rd towards Mt Hood. Your option is to stay on Lolo Pass and go above the trees to enjoy rare views of Mt Hood. You can ride for miles on this road which eventually goes to Lost Lake (apx 20 mi) or Hood River (there is 4 mi of unpaved road when riding to Lost Lake – this road is closed in winter). If you want a shorter ride head up Lolo Pass Rd for about 2 miles and go right onto Road 1825 labeled “campgrounds and trailheads”. Go over the Sandy River bridge and ride past the McNeil Campground and the road to Riley Horse Camp. This road eventually leads to the Ramona Falls trailhead. If you are not into biking then go hiking…the most popular thing to do on Mt Hood in summer. Take your car to the Ramona Falls trail head and venture up to the falls. This is about a 4 mi trek (8 total) and is an easy trail that follows the Sandy River with views of Mt Hood. Or take your car to Lost Lake and hike around the lake. This is a great 3 mile family trail again with great views of Mt Hood. At the 3200′ level, it is a great place to cool off on a hot summer day. Treat the family with an ice cream at the general store. You can picnic or rent a canoe or row boat…sunbath…fish…enjoy! Go out the cabin and take a left onto Lolo Pass Rd to highway 26. Go right onto 26 past Welches and Wemme and on the left you will see the sign to Wildwood Park. This is a must see and a great morning or afternoon activity…especially with the kids. There is a $5 per passenger car fee, worth it totally. This is a day use area home to a wide range of recreation facilities and the Cascade Streamwatch Trail. 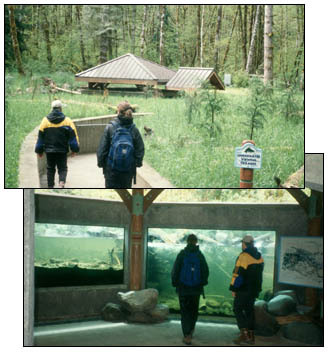 Visitors have a chance to explore natural stream and wetland ecosystems along accessible interpretive trails and boardwalks and observe native fish in a unique underwater fish viewing chamber. There are many picnic tables, playing fields, volleyball and basketball courts and trails. Take the wooden bridge over the Salmon River and head to the elevated wooden walkways that meander through the marshland. Read our blog, “Hike to Mirror Lake on Mt Hood.” We love this trail. Go down Lolo Pass to Highway 26 and go left up Mt Hood. About a mile below Government Camp to the right is the trail head. You will see the cars parked right along side the highway. Our blog gives a detailed explanation of the trail. This is a great family hike. Bring a small backpack with drinks and lunch and eat at the lake as a reward yourself for the climb up. Again..as always…do not forget the camera. 7. Golf at the Resort at the Mountain or visit their Spa for a Massage! The Resort at The Mountain’s 27-hole golf course, is nestled in the Salmon River Valley of the Mt. Hood National Forest. Golfers seeking an exceptional and scenic outing in the Mt. Hood area will find The Courses an exceptional choice. The full service spa offers massages, body wraps, manicures and pedicures. Call 503-622.2270 for a tee time or spa reservations or log onto www.theresort.com . Out the cabin go left onto Lolo Pass and go right onto 26. At the light in Welches go left and the resort is a little ways down on the left. Go down Lolo Pass Rd and go left onto Highway 26. Drive 10 miles up to Ski Bowl. You will see the lodge and parking area on the right. There is so much to do here and this can be a half day or full day activity. 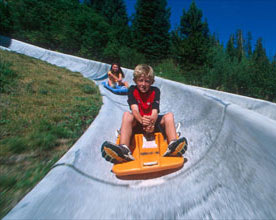 The Alpine Slide is FUN for all ages. After you purchase your tickets you choose a sled and head up the main lift. After reaching the top there are 2 tracks (fast and slow). My kids always go on the fast track and I at first take the slow one to get the hang of it…again! If you have little kids you can take them on the same sled as you. Ski Bowl also has kayak rentals/tours, white water rafting, bungee jump, zip line, indie carts, reverse bungee, sky ride, summer tube hill, mini golf, frisbee golf, mt bike park, batting cages and so much more. Log onto www.skibowl.com or information, daily passes or a-la-cart tickets. 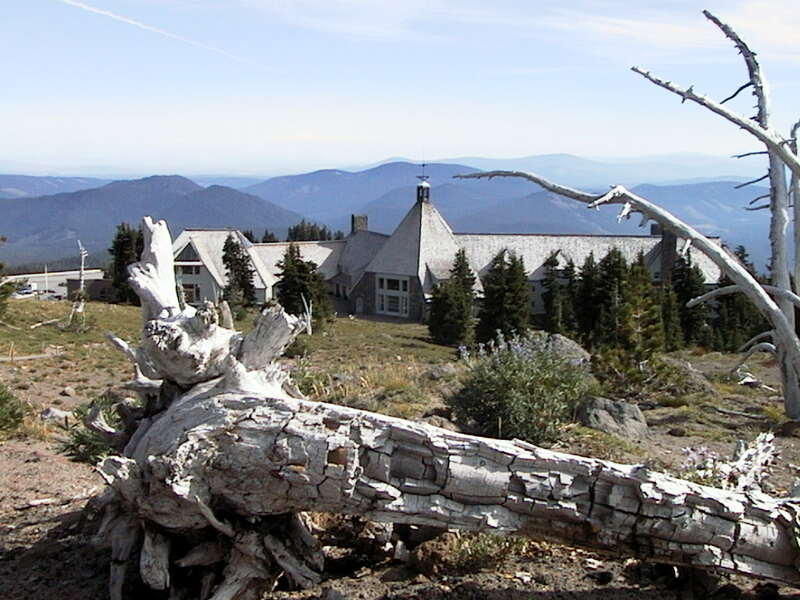 Read our blog called “Visit and Tour Timberline Lodge.” If you are staying at the Mt Hood Cabin this is a must experience. Tour the lodge and witness the amazing architecture. The dining experience is highly recommended. You can ski all summer in the morning and hike or play golf in the afternoon. We love to head up to the Cascade Dining room for the full breakfast buffet, served till 10AM, well worth it! Log onto www.timberlinelodge.com for more information. Trillium Lake is an extremely popular destination for picnickers, photographers, anglers, and just about any other outdoor enthusiasts. Its popularity is understandable. 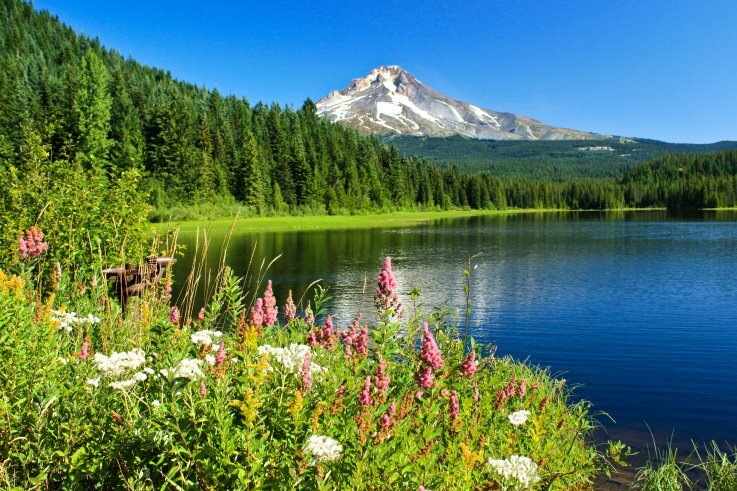 The lake boasts such a gorgeous view of Mount Hood, the place is frequently featured in national calendars and photo books. A wonderful trail circles this mountain gem. We took that hike a few years ago and as we headed east on the trail a bald eagle swooped down and glided along the water. It was a gift for the start of a perfect day. There are many picnic areas to act as a base, swim, fish, bring the blow up rafts and boats and bbq up some burgers and hot dogs. The area around the dam at the end of the lake was recently renovated and is a great place to relax and take in the views of Mt Hood. Bring your camera, this is a number one picture taking opportunity on Mt Hood! Go out the cabin and go Left down Lolo Pass and go right up highway 26 towards Mt Hood’s Alpine Village, Government Camp at 4000′. Once you hit Ski Bowl (on the right) take your next left and go into the town of Government Camp. In the past few years this town has gotten a facelift with new sidewalks and streetlamps. There are some great restaurants like the Huckleberry Inn or Mt Hood Brewing Co. and local pubs like Charlie’s Mountain View, all great experiences. 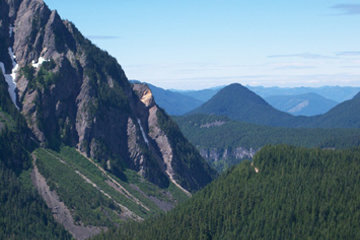 Visit the Mt Hood Cultural Center and Museum and discover the mountains history. Make some time to visit the Arts Cabins and sign up for classes which include knitting, beading, jewelry, spinning, book making and binding, painting, glass work and so much more. For more information about the Villages of Mt Hood (Zig Zag, Rhododendron, Welches, Wemme and Government Camp) log onto www.mthoodmagazine.com or www.mounthoodinfo.com. When planning your trip to Mt Hood stay in our luxury vacation home in Zig Zag Village. Log onto www.greatnorthwestcabins.com or call 503-492-8783 for information and reservations anyday till 9AM-9PM PST. We take visa or mc and dogs are welcome! 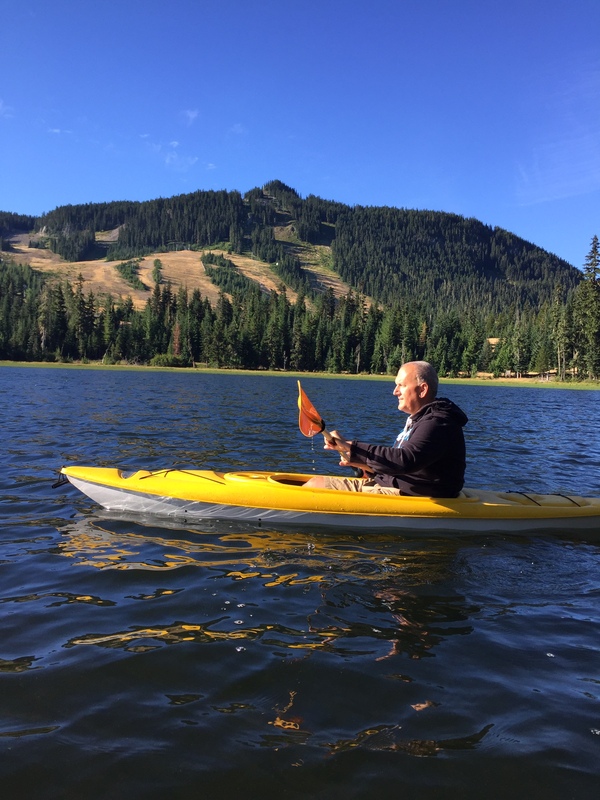 The Top 10 Things to do in Packwood, WA in Summer! As a family, we have been going to Packwood, WA for the past 18 years, we love it. We love summer as much as we love winter. We call it, “the place where God kissed the earth”. Here is our TOP 10 LIST of THINGS TO DO IN SUMMER at our cabins (all within a few miles)! 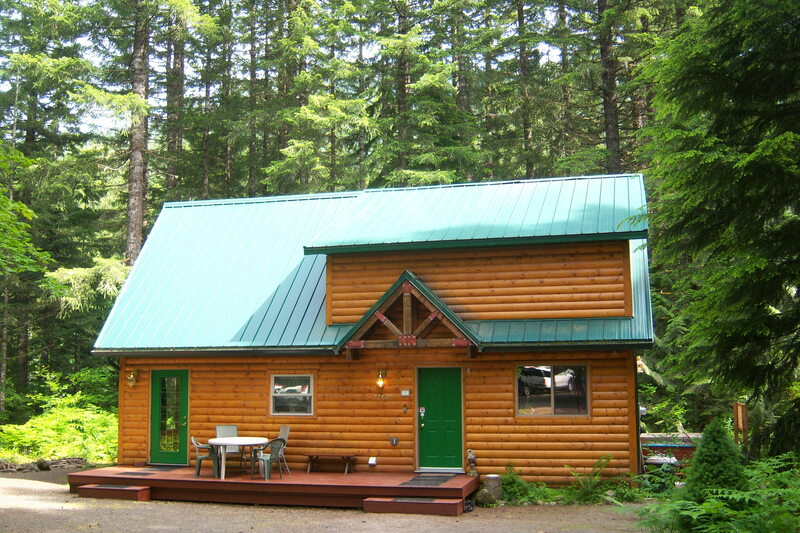 You can book one of our 4 Packwood cabins at http://www.greatnorthwestcabins.com or call 503-492-8783 from 9-9 PST! Stay with the best on Mt Rainier! 1. Relax…you can’t help but do this at the cabin in these amazing settings. 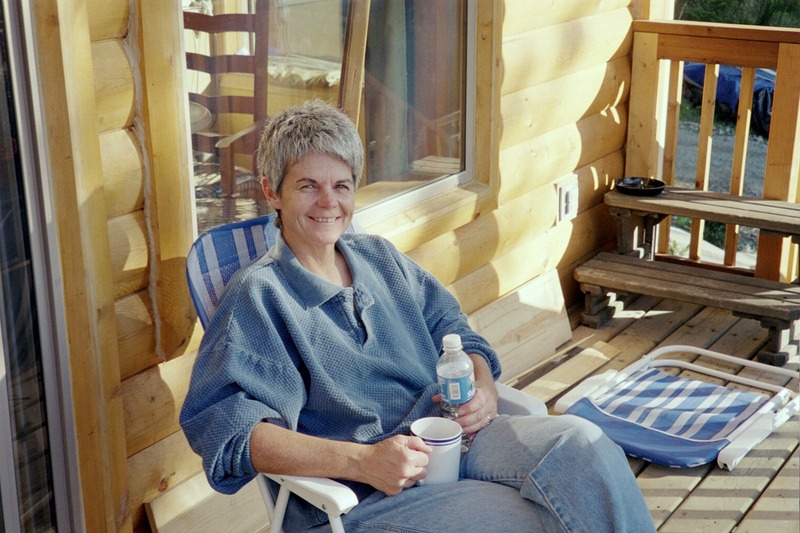 Relaxing on the porch at the Mt View Cabin! 2. Have a campfire, make smores and watch the stars. Campfire at the cabin under the stars! 3. 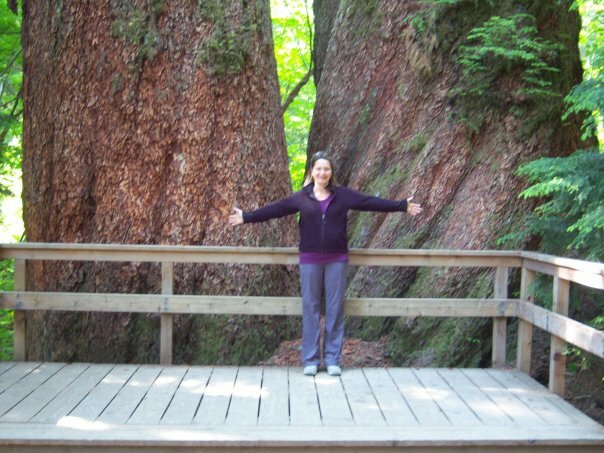 After dinner hike either the Grove of the Patriach old growth forest trail or Silver Falls trail, its light till late! 4. Walk downtown Packwood, get a coffee at the Butter Butte or a hamburger at Cliff Droppers…delicious! 5. Swim in the many rivers and lakes in the area! 6. 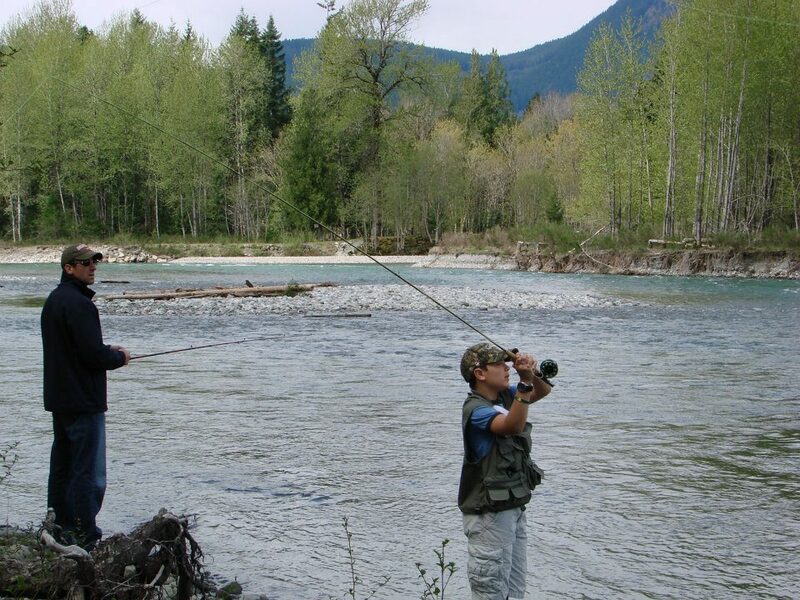 Fish the Cowlitz River or an upper alpine lake – our caretakers will tell you how to get there and catch em! 7. 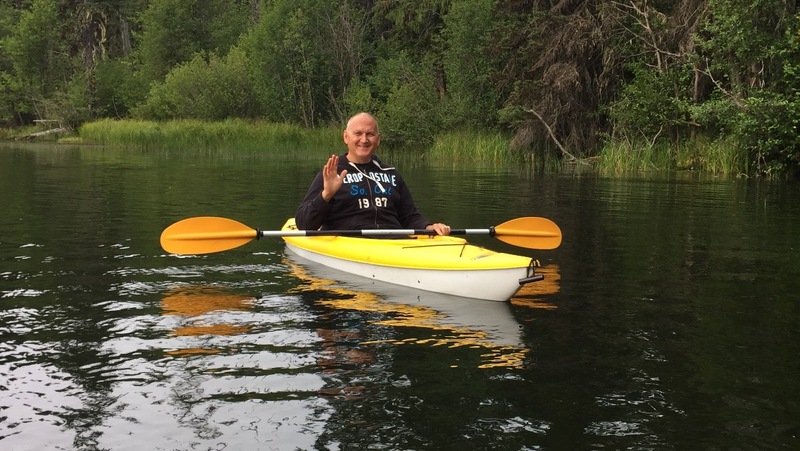 Head to one of the many lakes off highway 12 (see our blog about it) and jet ski, raft, kayak, picnic and swim! 8. 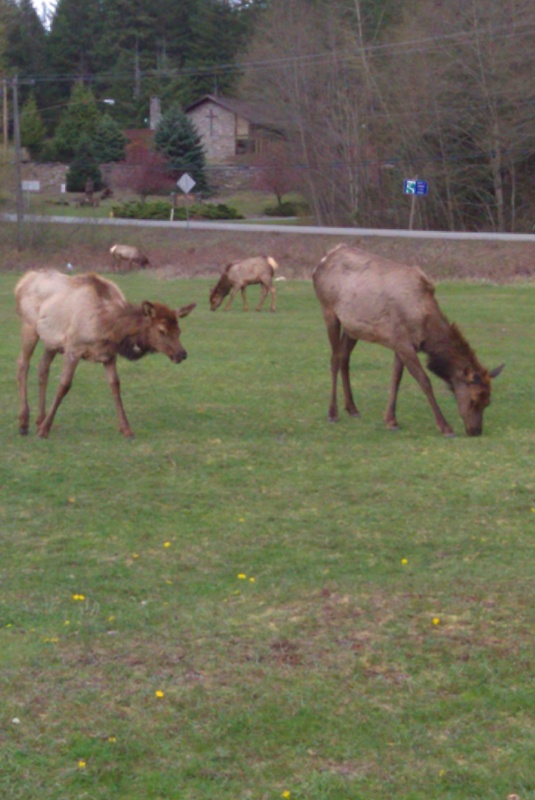 Elk hang out at the Cowlitz River Hotel in the evening. If you haven’t seen any elk at the cabin, head out after dinner and drive to town. Count them too. How many bulls (males with antlers) and how many cows (females – yes that is a funny name). Did you see any babies? 9. Bike up 6 mi Snyder Road to the Packwood Lake trail head. Take along a snack and share it as you enjoy the view! Then head back down the 6 mi road – it’s all downhill from here! 10. 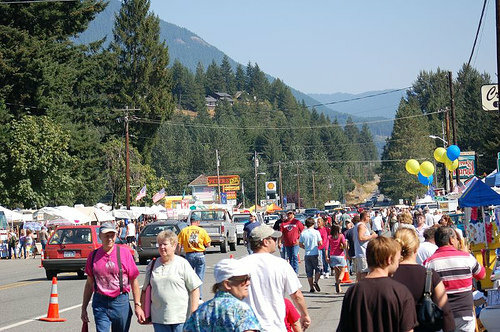 Attend the Memorial Day or Labor Day Flea Market in Packwood. From the Mt View or the Alpine Chalet you can walk there and do not need to pay for parking. With over 500 vendors and 10,000 visitors you will be wowed all weekend with good eats and treasures galore. Book early because those 2 holiday weekends book fast! At 14,410 feet, Mount Rainier is the fifth highest mountain in the continental 48 states. 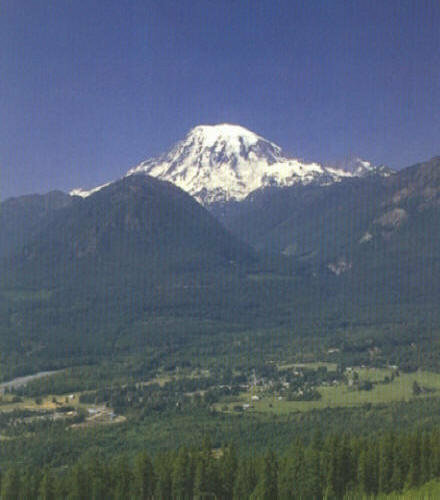 Packwood, Washington is home to a total of 86 mountain summits and peaks. There are 2 ways to get there in the spring, summer and fall. Go east on Highway 12 out of Packwood for about 7 miles. Take highway 123 left to the entrance to the park called the Stevens Canyon entrance. After you are in the park are hundred’s of trails, overlooks, alpine lakes and waterfalls to stop at as you climb to the main visitor center at Paradise and Paradise Inn. You can also get to Mt Rainier National Park via Skate Creek Road and the Nisqually entrance. In Packwood, to the right of the Shell station is Skate Creek Road. This is a windy road that follows the river. This is a beautiful river with many spots to stop along the way for fishing and wading. It’s about 20 miles till you get to the end and then go right to the Nisqually entrance of the park. This way to Paradise also hosts many many trailheads, waterfalls and picnic areas to stop at. 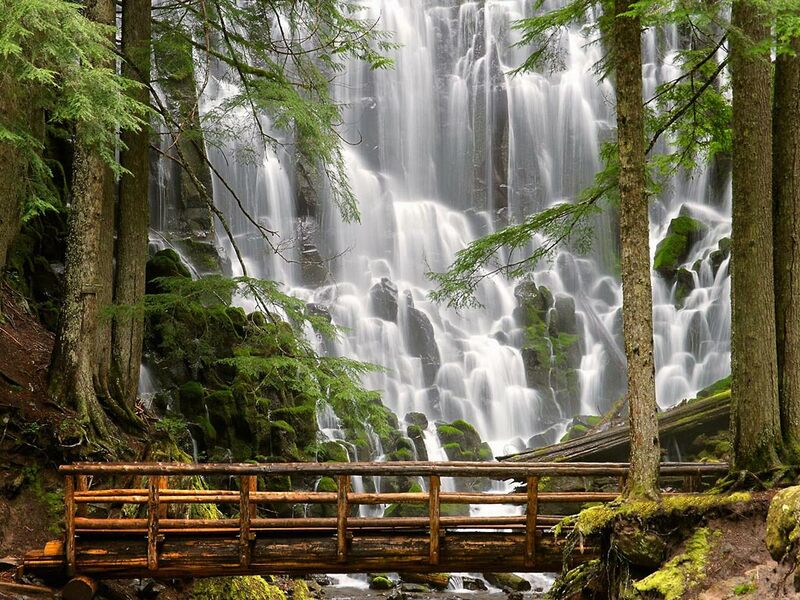 In the park don’t miss Nisqually Falls…spectacular! After reaching Paradise take some time to do some hiking. In summer the restored wildflower areas are beautiful. You can drive the whole loop back to Packwood. If you came in the Steven’s Canyon or Nisqually entrance go back the other way…both access roads are worth the drive and the views and lead back to Packwood. This loop is a total of about 75 miles. If you are staying with us in Packwood and only have one day and want to get a good overview of the park, this is the trip for you. Start early in the morning if you want to drive up to Paradise. There is limited parking up there. -Longmire Visitor Center – this area has many trial head along with a restaurant and gift shop. Ask the ranger if he can recommend some trails for your hiking level in this area. Stay with us, you will not be disappointed! Call anyday 9-9 PST for information and reservations. We take visa or mc and dogs are welcome! 110 Miles of Pure Oregon Joy! One Day Tour of Mt Hood and the Gorge! In summer, we have tons of people come from all over the world and stay in our Mt Hood Cabin. They come to hike, golf, ski and take in all that the area has to offer. If you only have a few days and you love to drive, this is the trip for you. This trip takes you on a big circle from our cabin in Welches, OR, up Mt Hood, down the east side into Hood River back through the Gorge and past all the amazing waterfalls and up through Troutdale, Gresham, Sandy and back to the cabin in Welches, OR, all about 110 miles! GETTING READY…load the car up with gas and a cooler full of cold drinks and snacks. In summer you don’t need to worry about the weather but if you are traveling in early spring or late fall, always make sure that you are ready for all kinds of weather when traveling over Mt Hood. Always bring an extra jacket or hoodie with you, you never know what the weather is like not only on Mt Hood but in the Gorge as well. FIRST LEG…head out of our community and go left onto Lolo Pass down to highway 26 (2 mi). Go left on Highway 26 and begin to head over Mt Hood. 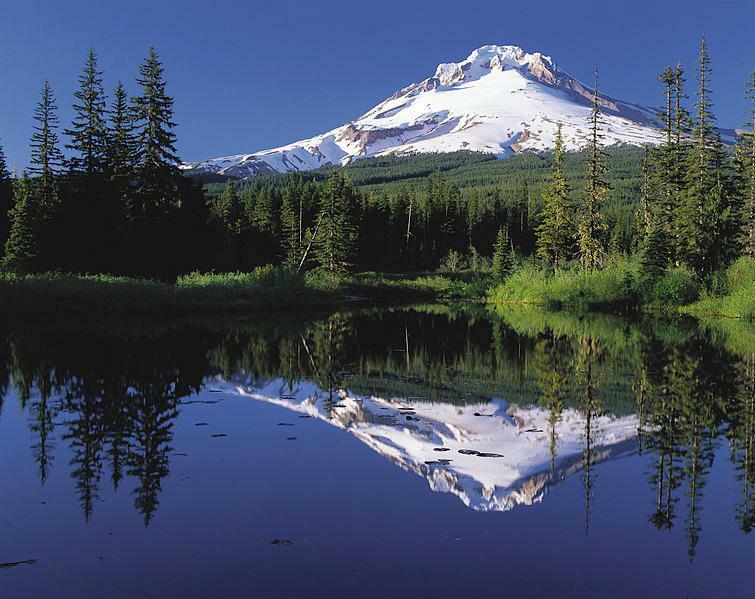 Our other blog topics go into detail about the hikes and tourist things to do on and close to Mt Hood like Ski Bowl Summer Fun, Government Camp, Timberline Lodge and various day hikes and such. So we suggest you drive over Mt Hood, past Government Camp and go right onto highway 35 North towards Hood River. This is a beautiful drive with many opportunities to stop and take in some amazing views of Mt Hood and the surrounding scenery. From the cabin to Hood River is about 40 miles. As you head furthur north you will pass Meadows Ski Resort, one of the larger ski areas on Mt Hood (we will blog about Meadows later). The road winds down into some of the most furtile territory in the northwest where orchards are in abundance with over 14000 acres of farmland growing commercial pear, apple, cherry and peach. 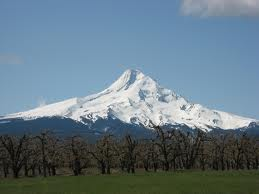 This county leads the world in Anjou pear production and 50% of the countries winter pear crop comes from Hood River. Cherries in spring, apples and pears in fall…stop by the many road side stands and pick up some fresh produce. HOOD RIVER…you could spend a whole day here in this city on the mighty Columbia River. You have just entered the wind surfing capital of the world. You can also kite board, paddle board, kayak, raft, rent a boat or jet ski or just take a dip in the ole’ Columbia. If anything, head down to the waterfront and watch the pros and the newbees taking a lesson. If you are a newbee sign up for a lesson and try it out. 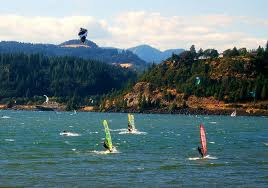 You never know it may become a passion or try it just to say, “I windsurfed in the Windsurfing Capital of the World.” The town of Hood River has a vibrant shopping area (remember that Oregon has no sales tax) and many restaurants to fit any budget. Try one of the local wines or microbrews or attend one of the many cultural events in the area. There is something for everyone in Hood River and perhaps you just want to make a day of it and then head back up to Mt Hood after dinner. Or for you, this trip to Hood River is nice for lunch and coffee but you really came to head down the Gorge and the likes of Multnomah Falls and Crown Point. For more information on Hood River log onto hoodriver.org. THE GORGE AND WATERFALL HEAVEN…We are now going to head west on highway 84, the main highway the spans the length of the Columbia River from Portland west to the border of Idaho east. This is an amazing road built right along the edge of the river with great views of the water and Washington on the other side. There is so much to do and see that if you are going to see it all you have to decide where you will stop. You can stop at the Bonneville Dam and Fish Hatchery, take pictures at the Bridge of the Gods or venture straight to the famous Multnomah Falls. It is again about 40 miles from Hood River to Multnomah Falls. You will see the signs. Pull off the highway and park in front of the lodge. It is a must to walk up to the bridge that spans the river over the falls, take pictures and feel the spray…powerful! If you arrived early you can hike to the top for about an hours trek, the view from the top looking down and of the gorge is one of a kind. There is a visitor center, snack shop, coffee cart or if you are up for something more fancy eat at the lodge itself. At least go up into the lodge lobby and ask to peak in (they will let you). The ambiance of the room with glass that allows you to look up at the falls is worth the stairs to get there. 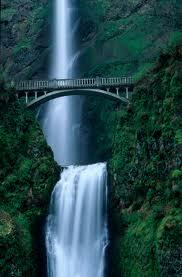 After you have gotten your fill of Multnomah Falls you have 2 choices. You can take highway 84 to Troutdale or take the Old Historic Highway (both end in the same place.) The Old Historic Highway takes off from the Multnomah Falls parking area and goes west. After a few miles you have a choice to go right to 84 or left. If you choose to go left you will not only be treated to incredible vistas but other parking areas that host many other gorge waterfalls. You can also visit the famous Vista House, an Oregon landmark recently renovated and one of the best east/west panoramic views of the Columbia River. Evenutally the old highway follows along the Sandy River and heads into the cute town of Troutdale. Troutdale as well has many shops and restuarants including the Troutdale Outlet Mall. Before heading on your last 30 mile drive, if you have not eaten dinner, you must visit The McMenamins at Edgefield. I can’t go into all that this resort like a microbrewery, winery, golf course, movie theatre, glass blowing, concert venue has to offer, but we love this place. It once was a poor farm where debtors were sent to work off their debt (what a great idea!). 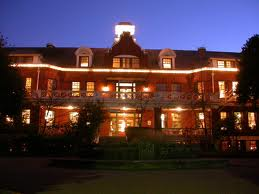 Now it is one of the many McMenamin brother’s famous northwest restaurants and resorts. If you do not have time this day then I would suggest that after you check out of the Mt Hood Cabin, come down and eat lunch or dinner at the Powerhouse Pub or outside on the large garden patio – a true northwest experience! McMenamins!! BACK TO THE CABIN…what a day…what a drive…what a vacation! To get back you will go up the hill on 257th south to Kane through Gresham (that’s where I live) and connect to highway 26 east through Sandy and back to Welches. This last leg of your drive is about 30 miles. Get gas, stop at some larger grocery stores to stock up and dream of returning to our amazing cabin and soaking in the hot tub after a great 110 mile northwest adventure.